We are not a sales site but we do have friends in San Stefanos and we want to see them survive and thrive. Therefore we will do everything we can to make sure you have the best holiday in San Stef. As strange as it might seem, if you book directly, your accommodation is not the riskiest part of your travel arrangements. Over the years several tour operators have gone bust but the resort and the local businesses are all still here. Even if your particular booking was to fail there are so many others available that even in the peak season you will not be left without a room or out of pocket. Most of the locals do not take a deposit you pay when you arrive. Hello and welcome, this site is quite simply dedicated to a place and people we love. On the North West corner of the Greek island of Corfu is a village called Agios Stefanos (San Stefanos). Thirty years ago it was a small harbour and not a lot more now it is a holiday resort with one of the best natural beaches on Corfu. The beach stretches in a gentle hook from the village on the southern end along and under the cliffs at the northern end. The southern end is I guess what most people now expect of a holiday beach with bars, restaurants and sun beds. However towards the northern end the beach is quieter, with large open expanses of sand and very few people. One word of warning this end of the beach is used by the naturalist community which some people may find offencive. This beach is quite dynamic, each year brings a beach which is slightly different, it's wider, there are more sand banks, a few rocks appear, it is always interesting to walk. The beach stretches out with a naturally shallow shelf which is very large. Several sand banks protect this area from the more open water making the inshore waters particularly warm. These sand banks can give a false sense of security and some care is need to ensure youngsters who can't swim don't get out of their depth. 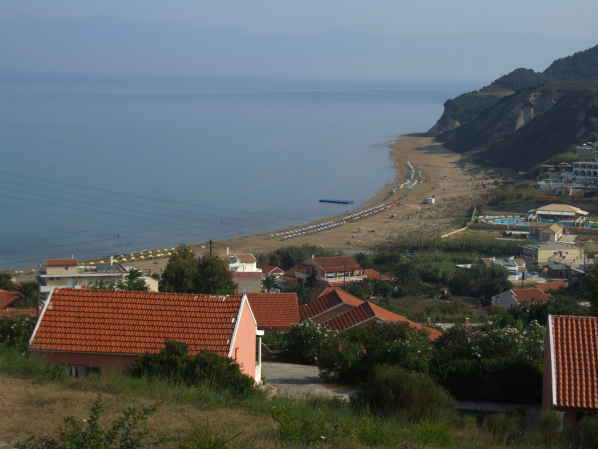 Many of the locals still live in the traditional ridge village Avliotes which is a couple of kilometres to the north east of Agios Stefanos (San Stefanos). Here the houses cling to the ridge in an attempt to catch the breeze when it's hot. A secondary advantage of such elevations is the easy drainage that occurs naturally to take away all the rain that falls in winter, the rain that makes Corfu such a green and lush location. So feel free to explore our site and learn more about San Stefanos and the island of Corfu!